SCI Technical Report, L.T. Tran, M. Berzins. No. UUSCI-2011-006, SCI Institute, University of Utah, 2011. C. Fowlkes, K. Eckenrode, M. Bragdon, M.D. Meyer, Z. Wunderlich, L. Simirenko, C. Luengo, S. Keranen, C. Henriquez, D. Knowles, M. Biggin, M. Eisen, A. DePace. In PLoS Genetics, Vol. 7, No. 10:e1002346, pp. 17 pages. October, 2011. Differences in the level, timing, or location of gene expression can contribute to alternative phenotypes at the molecular and organismal level. Understanding the origins of expression differences is complicated by the fact that organismal morphology and gene regulatory networks could potentially vary even between closely related species. To assess the scope of such changes, we used high-resolution imaging methods to measure mRNA expression in blastoderm embryos of Drosophila yakuba and Drosophila pseudoobscura and assembled these data into cellular resolution atlases, where expression levels for 13 genes in the segmentation network are averaged into species-specific, cellular resolution morphological frameworks. We demonstrate that the blastoderm embryos of these species differ in their morphology in terms of size, shape, and number of nuclei. We present an approach to compare cellular gene expression patterns between species, while accounting for varying embryo morphology, and apply it to our data and an equivalent dataset for Drosophila melanogaster. 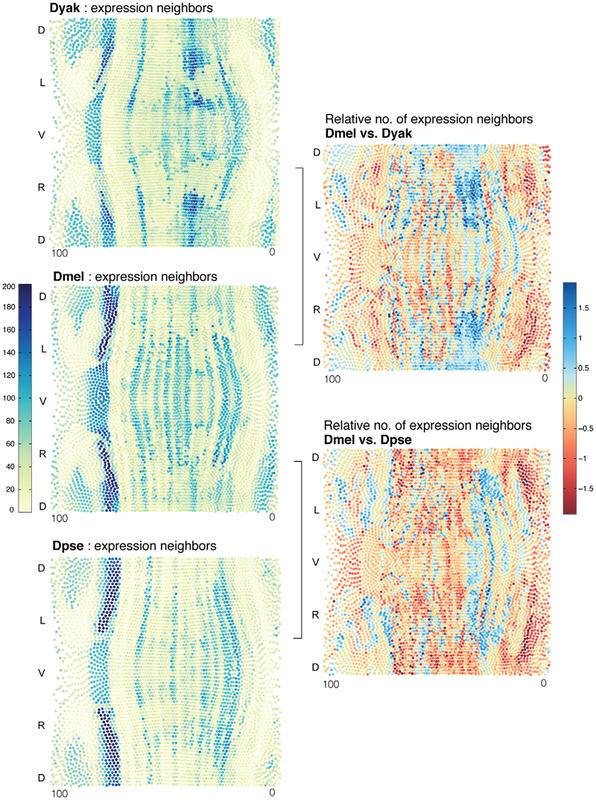 Our analysis reveals that all individual genes differ quantitatively in their spatio-temporal expression patterns between these species, primarily in terms of their relative position and dynamics. Despite many small quantitative differences, cellular gene expression profiles for the whole set of genes examined are largely similar. This suggests that cell types at this stage of development are conserved, though they can differ in their relative position by up to 3-4 cell widths and in their relative proportion between species by as much as 5-fold. Quantitative differences in the dynamics and relative level of a subset of genes between corresponding cell types may reflect altered regulatory functions between species. Our results emphasize that transcriptional networks can diverge over short evolutionary timescales and that even small changes can lead to distinct output in terms of the placement and number of equivalent cells. Z. Fu, W.-K. Jeong, Y. Pan, R.M. Kirby, R.T. Whitaker. In SIAM Journal of Scientific Computing, Vol. 33, No. 5, pp. 2468--2488. 2011. This paper presents an efficient, fine-grained parallel algorithm for solving the Eikonal equation on triangular meshes. The Eikonal equation, and the broader class of Hamilton–Jacobi equations to which it belongs, have a wide range of applications from geometric optics and seismology to biological modeling and analysis of geometry and images. The ability to solve such equations accurately and efficiently provides new capabilities for exploring and visualizing parameter spaces and for solving inverse problems that rely on such equations in the forward model. Efficient solvers on state-of-the-art, parallel architectures require new algorithms that are not, in many cases, optimal, but are better suited to synchronous updates of the solution. In previous work [W. K. Jeong and R. T. Whitaker, SIAM J. Sci. Comput., 30 (2008), pp. 2512–2534], the authors proposed the fast iterative method (FIM) to efficiently solve the Eikonal equation on regular grids. In this paper we extend the fast iterative method to solve Eikonal equations efficiently on triangulated domains on the CPU and on parallel architectures, including graphics processors. We propose a new local update scheme that provides solutions of first-order accuracy for both architectures. We also propose a novel triangle-based update scheme and its corresponding data structure for efficient irregular data mapping to parallel single-instruction multiple-data (SIMD) processors. We provide detailed descriptions of the implementations on a single CPU, a multicore CPU with shared memory, and SIMD architectures with comparative results against state-of-the-art Eikonal solvers. G. Gopalakrishnan, R.M. Kirby, S. Siegel, R. Thakur, W. Gropp, E. Lusk, B.R. de Supinski, M. Schultz, G. Bronevetsky. In Communications of the ACM, pp. (accepted). 2011. C.R. Henak, B.J. Ellis, M.D. Harris, A.E. Anderson, C.L. Peters, J.A. Weiss. In Journal of Biomechanics, Vol. 44, No. 12, pp. 2201-2206. 2011. The relatively high incidence of labral tears among patients presenting with hip pain suggests that the acetabular labrum is often subjected to injurious loading in vivo. However, it is unclear whether the labrum participates in load transfer across the joint during activities of daily living. 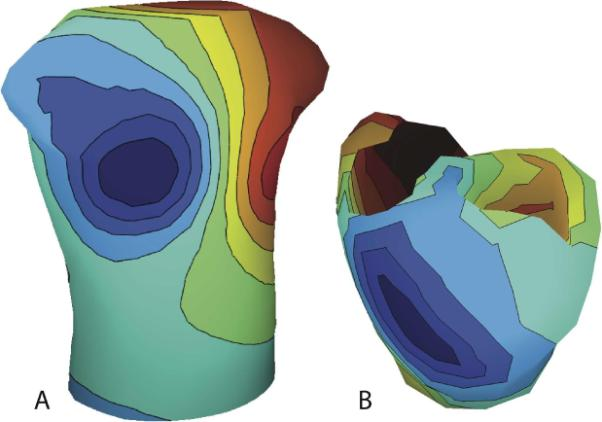 This study examined the role of the acetabular labrum in load transfer for hips with normal acetabular geometry and acetabular dysplasia using subject-specific finite element analysis. Models were generated from volumetric CT data and analyzed with and without the labrum during activities of daily living. The labrum in the dysplastic model supported 4–11\% of the total load transferred across the joint, while the labrum in the normal model supported only 1–2\% of the total load. Despite the increased load transferred to the acetabular cartilage in simulations without the labrum, there were minimal differences in cartilage contact stresses. This was because the load supported by the cartilage correlated with the cartilage contact area. 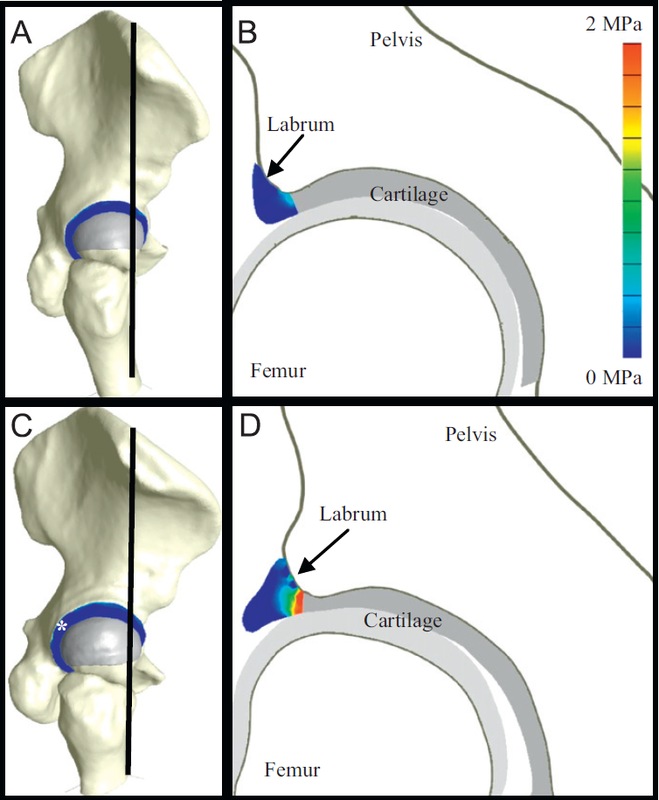 A higher percentage of load was transferred to the labrum in the dysplastic model because the femoral head achieved equilibrium near the lateral edge of the acetabulum. The results of this study suggest that the labrum plays a larger role in load transfer and joint stability in hips with acetabular dysplasia than in hips with normal acetabular geometry. M. Schulz, J.A. Levine, P.-T. Bremer, T. Gamblin, V. Pascucci. In International Conference on Parallel Processing, Taipei, Taiwan, IEEE, pp. 206--215. 2011. B. Nelson, R. Haimes, R.M. Kirby. In IEEE Transactions on Visualization and Computer Graphics (IEEE Visualization Issue), Vol. 17, No. 12, pp. 1803--1811. 2011. We present a GPU-based ray-tracing system for the accurate and interactive visualization of cut-surfaces through 3D simulations of physical processes created from spectral/hp high-order finite element methods. When used by the numerical analyst to debug the solver, the ability for the imagery to precisely reflect the data is critical. In practice, the investigator interactively selects from a palette of visualization tools to construct a scene that can answer a query of the data. This is effective as long as the implicit contract of image quality between the individual and the visualization system is upheld. OpenGL rendering of scientific visualizations has worked remarkably well for exploratory visualization for most solver results. This is due to the consistency between the use of first-order representations in the simulation and the linear assumptions inherent in OpenGL (planar fragments and color-space interpolation). Unfortunately, the contract is broken when the solver discretization is of higher-order. There have been attempts to mitigate this through the use of spatial adaptation and/or texture mapping. These methods do a better job of approximating what the imagery should be but are not exact and tend to be view-dependent. This paper introduces new rendering mechanisms that specifically deal with the kinds of native data generated by high-order finite element solvers. The exploratory visualization tools are reassessed and cast in this system with the focus on image accuracy. This is accomplished in a GPU setting to ensure interactivity. B.M. Burton, J.D. Tate, B. Erem, D.J. Swenson, D.F. Wang, D.H. Brooks, P.M. van Dam, R.S. MacLeod. In Proceedings of the 2011 IEEE Int. Conf. Engineering and Biology Society (EMBC), pp. 267--270. 2011. Computational modeling in electrocardiography often requires the examination of cardiac forward and inverse problems in order to non-invasively analyze physiological events that are otherwise inaccessible or unethical to explore. The study of these models can be performed in the open-source SCIRun problem solving environment developed at the Center for Integrative Biomedical Computing (CIBC). A new toolkit within SCIRun provides researchers with essential frameworks for constructing and manipulating electrocardiographic forward and inverse models in a highly efficient and interactive way. The toolkit contains sample networks, tutorials and documentation which direct users through SCIRun-specific approaches in the assembly and execution of these specific problems. Guoning Chen, Qingqing Deng, Andrzej Szymczak, Robert S. Laramee, and Eugene Zhang. In IEEE Transactions on Visualization and Computer Graphics (TVCG), Vol. 18, No. 5, pp. 767--782. June, 2011. Morse decomposition provides a numerically stable topological representation of vector fields that is crucial for their rigorous interpretation. However, Morse decomposition is not unique, and its granularity directly impacts its computational cost. In this paper, we propose an automatic refinement scheme to construct the Morse Connection Graph (MCG) of a given vector field in a hierarchical fashion. Our framework allows a Morse set to be refined through a local update of the flow combinatorialization graph, as well as the connection regions between Morse sets. The computation is fast because the most expensive computation is concentrated on a small portion of the domain. Furthermore, the present work allows the generation of a topologically consistent hierarchy of MCGs, which cannot be obtained using a global method. The classification of the extracted Morse sets is a crucial step for the construction of the MCG, for which the Poincaré index is inadequate. We make use of an upper bound for the Conley index, provided by the Betti numbers of an index pair for a translation along the flow, to classify the Morse sets. This upper bound is sufficiently accurate for Morse set classification and provides supportive information for the automatic refinement process. An improved visualization technique for MCG is developed to incorporate the Conley indices. Finally, we apply the proposed techniques to a number of synthetic and real-world simulation data to demonstrate their utility. J. Mandel, J.D. Beezley, A. Kochanski, V.Y. Kondratenko, L. Zhang, E. Anderson, J. Daniels II, C.T. Silva, C.R. Johnson. In Proceedings of the Ninth Symposium on Fire and Forest Meteorology, pp. (published online). 2011. D.J. Swenson, S.E. Geneser, J.G. Stinstra, R.M. Kirby, R.S. MacLeod. In Annals of Biomedical Engineering, Vol. 39, No. 12, pp. 2900--2910. 2011. The electrocardiogram (ECG) is ubiquitously employed as a diagnostic and monitoring tool for patients experiencing cardiac distress and/or disease. It is widely known that changes in heart position resulting from, for example, posture of the patient (sitting, standing, lying) and respiration significantly affect the body-surface potentials; however, few studies have quantitatively and systematically evaluated the effects of heart displacement on the ECG. The goal of this study was to evaluate the impact of positional changes of the heart on the ECG in the specific clinical setting of myocardial ischemia. To carry out the necessary comprehensive sensitivity analysis, we applied a relatively novel and highly efficient statistical approach, the generalized polynomial chaos-stochastic collocation method, to a boundary element formulation of the electrocardiographic forward problem, and we drove these simulations with measured epicardial potentials from whole-heart experiments. Results of the analysis identified regions on the body-surface where the potentials were especially sensitive to realistic heart motion. The standard deviation (STD) of ST-segment voltage changes caused by the apex of a normal heart, swinging forward and backward or side-to-side was approximately 0.2 mV. Variations were even larger, 0.3 mV, for a heart exhibiting elevated ischemic potentials. These variations could be large enough to mask or to mimic signs of ischemia in the ECG. Our results suggest possible modifications to ECG protocols that could reduce the diagnostic error related to postural changes in patients possibly suffering from myocardial ischemia. D. Thompson, J.A. Levine, J.C. Bennett, P.-T. Bremer, A. Gyulassy, V. Pascucci, P.P. Pebay. In Proceedings of the 2011 IEEE Symposium on Large-Scale Data Analysis and Visualization (LDAV), Providence, RI, pp. 23--30. 2011. T. Peterka, R. Ross, A. Gyulassy, V. Pascucci, W. Kendall, H.-W. Shen, T.-Y. Lee, A. Chaudhuri. In Proceedings of the 2011 IEEE Symposium on Large-Scale Data Analysis and Visualization (LDAV), pp. 105--112. October, 2011. We present a set of building blocks that provide scalable data movement capability to computational scientists and visualization researchers for writing their own parallel analysis. The set includes scalable tools for domain decomposition, process assignment, parallel I/O, global reduction, and local neighborhood communicationtasks that are common across many analysis applications. The global reduction is performed with a new algorithm, described in this paper, that efficiently merges blocks of analysis results into a smaller number of larger blocks. The merging is configurable in the number of blocks that are reduced in each round, the number of rounds, and the total number of resulting blocks. We highlight the use of our library in two analysis applications: parallel streamline generation and parallel Morse-Smale topological analysis. The first case uses an existing local neighborhood communication algorithm, whereas the latter uses the new merge algorithm. S. Williams, M. Petersen, P.-T. Bremer, M. Hecht, V. Pascucci, J. Ahrens, M. Hlawitschka, B. Hamann. In IEEE Transactions on Visualization and Computer Graphics, Proceedings of the 2011 IEEE Visualization Conference, Vol. 17, No. 12, pp. 2088--2095. 2011. S. Kumar, V. Vishwanath, P. Carns, B. Summa, G. Scorzelli, V. Pascucci, R. Ross, J. Chen, H. Kolla, R. Grout. In Proceedings of The IEEE International Conference on Cluster Computing, pp. 103--111. September, 2011. T.A. Quinn, S. Granite, M.A. Allessie, C. Antzelevitch, C. Bollensdorff, G. Bub, R.A.B. Burton, E. Cerbai, P.S. Chen, M. Delmar, D. DiFrancesco, Y.E. Earm, I.R. Efimov, M. Egger, E. Entcheva, M. Fink, R. Fischmeister, M.R. Franz, A. Garny, W.R. Giles, T. Hannes, S.E. Harding, P.J. Hunter, s, G. Iribe, J. Jalife, C.R. Johnson, R.S. Kass, I. Kodama, G. Koren, P. Lord, V.S. Markhasin, S. Matsuoka, A.D. McCulloch, G.R. Mirams, G.E. Morley, S. Nattel, D. Noble, S.P. Olesen, A.V. Panfilov, N.A. Trayanova, U. Ravens, S. Richard, D.S. Rosenbaum, Y. Rudy, F. Sachs, F.B. Sachse, D.A. Saint, U. Schotten, O. Solovyova, P. Taggart, L. Tung, A. Varrò, P.G. Volders, K. Wang, J.N. Weiss, E. Wettwer, E. White, R. Wilders, R.L. Winslow, P. Kohl. In Progress in Biophysics and Molecular Biology, Vol. 107, No. 1, Elsevier, pp. 4--10. October, 2011. Cardiac experimental electrophysiology is in need of a well-defined Minimum Information Standard for recording, annotating, and reporting experimental data. As a step toward establishing this, we present a draft standard, called Minimum Information about a Cardiac Electrophysiology Experiment (MICEE). The ultimate goal is to develop a useful tool for cardiac electrophysiologists which facilitates and improves dissemination of the minimum information necessary for reproduction of cardiac electrophysiology research, allowing for easier comparison and utilisation of findings by others. It is hoped that this will enhance the integration of individual results into experimental, computational, and conceptual models. In its present form, this draft is intended for assessment and development by the research community. We invite the reader to join this effort, and, if deemed productive, implement the Minimum Information about a Cardiac Electrophysiology Experiment standard in their own work. S.E. Geneser, J.D. Hinkle, R.M. Kirby, Bo Wang, B. Salter, S. Joshi. In Medical Image Analysis, Vol. 15, No. 4, pp. 640--649. 2011. Q. Meng, M. Berzins, J. Schmidt. In Proceedings of the TeraGrid 2011 Conference, Salt Lake City, Utah, ACM, July, 2011. The Uintah Software framework was developed to provide an environment for solving fluid-structure interaction problems on structured adaptive grids on large-scale, long-running, data-intensive problems. Uintah uses a combination of fluid-flow solvers and particle-based methods for solids together with a novel asynchronous task-based approach with fully automated load balancing. Uintah's memory use associated with ghost cells and global meta-data has become a barrier to scalability beyond O(100K) cores. A hybrid memory approach that addresses this issue is described and evaluated. The new approach based on a combination of Pthreads and MPI is shown to greatly reduce memory usage as predicted by a simple theoretical model, with comparable CPU performance. B.M. Isaacson, J.G. Stinstra, R.D. Bloebaum, COL P.F. Pasquina, R.S. MacLeod. In IEEE Transactions on Biomedical Engineering, Vol. 58, No. 10, pp. 2991--2994. 2011. Although the survival rates of warfighters in recent conflicts are among the highest in military history, those who have sustained proximal limb amputations may present additional rehabilitation challenges. In some of these cases, traditional prosthetic limbs may not provide adequate function for service members returning to an active lifestyle. Osseointegration has emerged as an acknowledged treatment for those with limited residual limb length and those with skin issues associated with a socket together. Using this technology, direct skeletal attachment occurs between a transcutaneous osseointegrated implant (TOI) and the host bone, thereby eliminating the need for a socket. While reports from the first 100 patients with a TOI have been promising, some rehabilitation regimens require 12-18 months of restricted weight bearing to prevent overloading at the bone-implant interface. Electrically induced osseointegration has been proposed as an option for expediting periprosthetic fixation and preliminary studies have demonstrated the feasibility of adapting the TOI into a functional cathode. To assure safe and effective electric fields that are conducive for osseoinduction and osseointegration, we have developed multiscale modeling approaches to simulate the expected electric metrics at the bone--implant interface. 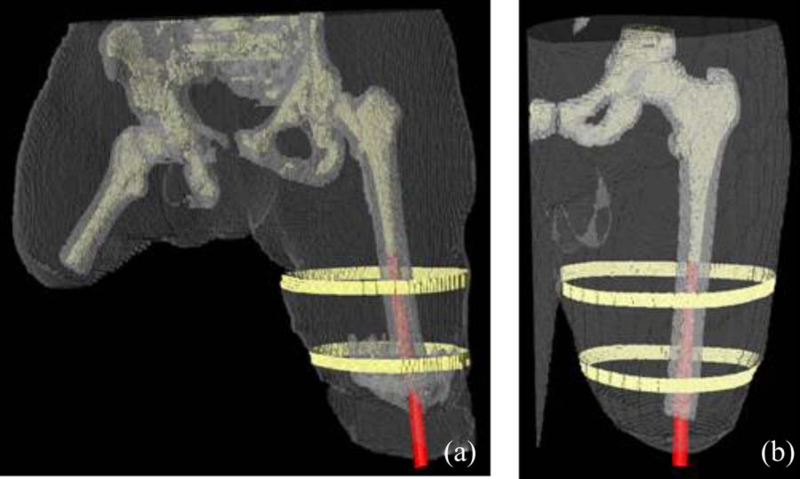 We have used computed tomography scans and volume segmentation tools to create anatomically accurate models that clearly distinguish tissue parameters and serve as the basis for finite element analysis. This translational computational biological process has supported biomedical electrode design, implant placement, and experiments to date have demonstrated the clinical feasibility of electrically induced osseointegration. L.T. Tran, M. Berzins. In International Journal For Numerical Methods In Fluids, Note: Published online 20 July, 2011.